Priced Per Piece – 20g to 16g – 1/4″ to 1/2″ diameters – Available in yellow, rose, and white gold. If you have any questions or requests, please contact us. Thanks! 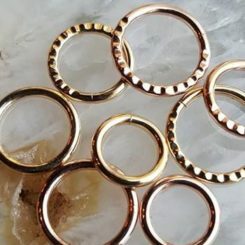 We currently have about a 1-2 week turnaround on these seamless rings! Please call or email for more information on this piece – Made from Yellow, White, and Rose Gold. 14g only available with hinge. The hinge is what makes the 14g piece more expensive. Other sizes are seamless.